Finding the perfect cup of Joe in Salt Lake City. The art of coffee is more than what meets the tongue. From thick, frothy latte-tops to burnt pot-bottoms, the local coffee scene is diverse, eclectic and full of passion. Downtown Salt Lake City has an abundance of coffee shops, baristas and roasters who share their exuberance for making a perfect cup of the brown drink. Foo-foo lattes and caramel macchiatos lose their novelty after a while. With so many variables involved in making a well-constructed espresso drink — pressure, the beans’ grind, water temperature, length of pour, steaming milk to the right frothiness — the simplicity of a straightforward, quality cup of java may be overlooked. Coffee is more than the caffeinated sludge that helps drinkers face the ardors of the day. Sure, it packs a wallop, but when executed with quality and style, the finer flavors unfold. “Coffee can be thought of in the same way as wine. From an institutional standpoint, it’s treated the same,” says Joe Evans, owner of Nobrow Coffee & Tea Company (315 E. 300 South, 801.364.3448, NobrowCoffee.com). “There are two-times the tasteable flavors in coffee versus wine; it breaks something like 300.” Evans is fervent about flavor—that’s why his fresh roasts are delivered twice a week. Nobrow’s philosophy, according to Evans, is that “any indulgence should be accessible.” He also believes that good taste is learned with language and a minor amount of training. So, if brewed correctly, everyone can smell hints of hazelnut or taste elderberry undertones in the right cup of coffee. For many, freshness is the key; coffee begins to become stale right out of the roaster. “Flavor profiles rise in coffee for about five days, then decline, and at about 15 days [post-roast] your coffee goes rancid,” says roaster Cruser Rowland of Jack Mormon Coffee (82 E St., 801- 913-8879, JackMormonCoffee.com). While it won’t make you sick, it’s like bread in the fridge—it loses its zest and sumptuousness. The common fix is a “dark” roast, which makes the coffee sweeter, enhancing caramel flavors and natural oils. A “lighter” roast will bring out subtlety and delicate notes in the coffee. Light roasts also deliver more caffeine. Latin American coffees are more balanced, bright and light, so drink them with breakfast foods. Ethiopian coffees generally have a lot of acidity, making them bright, with hints of cranberry. They pair nicely with a Spanish cheese such as Manchego. Most other African coffees pair surprisingly well with meat. Espresso, typically a strong and quick drink, is best paired with sweets and chocolates. 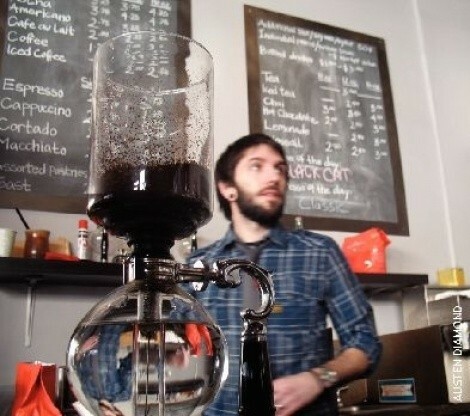 Coffee’s finer flavors are more easily expressed using a siphon coffee maker. The device, working off basic physical principles, heats water. Vapor rises and steeps the coffee grounds above. Once the coffee is brewed, heat is taken away and gravity pulls the infused brew down and away from the grounds—unlike a French press—leaving a clean, pristine cup. With this contraption, used at Nobrow and Caffe D’Bolla (249 E. 400 South, 801- 355-1398, CaffeDBolla.com), you’ll discover complexities in a cup of coffee you’ve never experienced before.